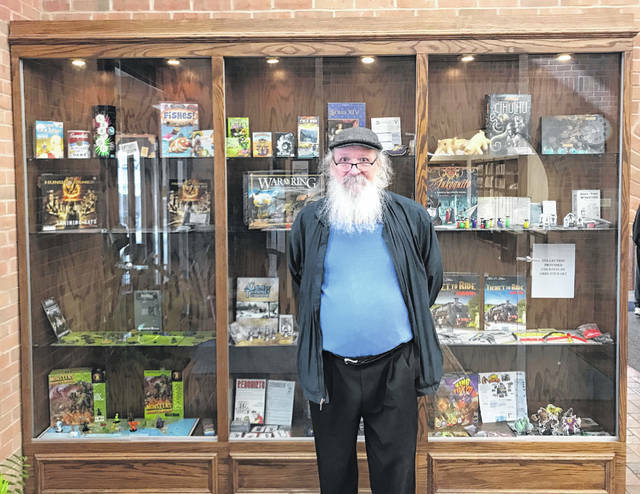 Greg Stewart is pictured in front of his board games that were recently on display at the Greenfield Branch Library. The Greenfield Branch Library has a lovely February planned. Our display case will host a collection of collectable Valentine cards from Deb Wise. There is also a Valentine Decorating Contest that will go on until Feb. 9. Participants can sign up at the circulation desk and receive a template to decorate. Judging will be on Feb. 11 with prizes for kids, teens and adults. The Middle School Book Club will meet on Tuesday, Feb. 5 at 5:30 p.m. to discuss our New Year, New Book and to pick up copies of “Son” by Lois Lowry, which we will read and discuss next month. Pizza and drinks will be provided. All middle school students are invited. This is a great meeting to join because we all read different books. The High School Book Club will meet on Wednesday, Feb. 6 at 5:30 p.m. (normally, we meet on Thursdays so be aware). We will discuss the books we chose individually in January and pick up copies of “The Perks of Being a Wallflower” by Stephen Chbosky, which we will read and discuss at the next meeting. Pizza and drinks will be provided. Story time will be every Wednesday at 11 a.m. We will have songs, crafts, stories and other activities for children preschool age and younger. Our themes this month include: Way out West on Feb. 6, Valentines on Feb. 13, Polar Bears on Feb. 20, and Sleepy Sheep (wear PJs) on Feb. 27. If there is inclement weather on Wednesday mornings, please give us a call to see if we are open before heading out. The Greenfield library hosts a Senior Exercise Class every Wednesday at 1 p.m. The fun-filled class is facilitated by Edgewood Manor. Join the group in doing exercises geared toward seniors. The Greenfield Branch and all other branches of the Highland County District Library will be closed on Monday, Feb. 18 in observance of Presidents’ Day. The library staff wish you a Happy Valentine’s Day. We hope to see you soon. Spencer McNeil is an employee at the Greenfield Branch Library.